Daphne City Hall is located at 1705 Main Street, Daphne, AL 36526; phone: 251-621-9000. 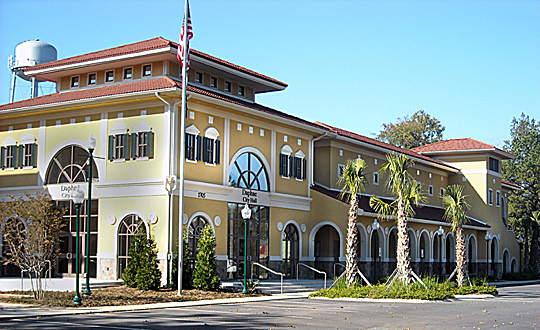 Photo: Daphne City Hall, built ca, 2008, Baldwin County, Al, photographed by username: JodyB, 2008, en.wikipedia.org, accessed July, 2011. Prior to 1560, a number of different Indian tribes occupied the area, including Tensaw, Choctaw, Creeks and Seminoles. The area was settled by Europeans as early as 1763 and was then known as "The Village." A post office was established in 1874. Prior to the Civil War Daphne was a resort area. Incorporated in 1927, Daphne served for a time as the Baldwin County seat of government. History. City of Daphne, www.daphneal.com, accessed July, 2011.